AMSOIL Signature Series Synthetic Motor Oil delivers extraordinary lubrication in all types of automotive gasoline engines. By combining industry-premier synthetic technology with AMSOIL premium additives, Signature Series Synthetic Motor Oil exceeds the higher performance demands of modern engines. 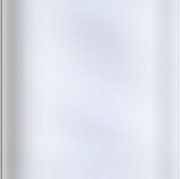 It delivers long-lasting performance and protection. AMSOIL Signature Series Synthetic Motor Oil delivers extraordinary lubrication in all types of automotive petrol engines. By combining industry-premier synthetic technology with AMSOIL premium additives, Signature Series Synthetic Motor Oil exceeds the higher performance demands of modern engines. AMSOIL OE Synthetic Motor Oils help provide better wear control, high- and low-temperature protection and increased fuel economy compared to conventional oils. The oil drain interval recommendations for many of today�s vehicles extend well beyond the traditional 3,000-mile interval, some up to 12,000 miles with electronic oil monitoring systems. AMSOIL OE Oils provide excellent protection and performance for the entire length of the original equipment manufacturer�s recommended drain interval. AMSOIL European Car Formula 5W-30 Synthetic Motor Oil provides exceptional performance and protection for high-performance European vehicles made by Volkswagen, Audi, Mercedes-Benz, BMW, Porsche and more. Its low-viscosity formulation maximizes fuel efficiency without compromising engine protection, while meeting strict European performance requirements for petrol and direct-injection diesel engines designed for low-viscosity oils. Formulated with low sulfated ash, phosphorus and sulfur (SAPS), AMSOIL European Car Formula 5W-30 Synthetic Motor Oil complies with modern emissions systems to provide optimum life and performance. 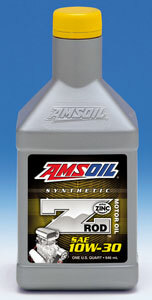 AMSOIL Z-ROD� Synthetic Motor Oil is specially engineered for classic and high-performance vehicles. A high-zinc formulation to prevent wear on flat-tappet camshafts and other critical engine components, along with a proprietary blend of rust and corrosion inhibitors for added protection during long-term storage. Full-SAPS European Oil for European Petrol and Diesel Engines Formulated for the lubrication needs of European petrol and diesel cars and light trucks. Its full sulfated ash, phosphorus and sulfur (SAPS) formulation provides excellent protection and performance for a wide range of vehicles. 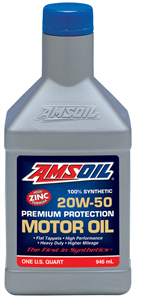 AMSOIL Synthetic 5W-40 European Motor Oil is specially formulated for the lubrication needs of European petrol and diesel cars and light trucks. Formulated with advanced AMSOIL synthetic base stocks, premium additives and a broad 5W-40 viscosity rating, AMSOIL 5W-40 allows motorists to take advantage of the maximum extended drain intervals recommended by European automakers while providing second-to-none protection and performance in the most demanding operating conditions. Formulated for use in both petrol and diesel engines. Offers multi-functionality and excellent wear protection. Ideal for applications where the extra protection of a higher viscosity oil is desired. Excellent for motor homes and older vehicles, as well as most types of modern equipment. Also compatible for use in motorcycles. For use in both diesel and petrol engines. Ideal for applications where the extra protection of a higher-viscosity oil is desired. The higher viscosity may help reduce motor oil consumption in equipment experiencing higher than normal oil usage rates while running lower viscosity lubricants.